If your future includes a move, check out the Coalinga movers from Meathead Movers! Our professionally trained student-athlete movers, moving concierge, and princess packers are prepared to get you safely moved into your new Coalinga home. Hiring trustworthy Coalinga movers is the best way to make sure that your transition to this stunning community is stress-free and easy. A small community known as The Sunny Side of the Valley, this city is one of Fresno County’s most welcoming cities. If you are moving to Coalinga, you’ll find yourself surrounded by the natural beauty of California’s West Valley Mountain Range. The city provides easy access to the rest of the West Coast via I-5, which is just a 10-minute drive away. The city was originally founded as a coal production town for the railroads, but today the community is fueled by the bustling agricultural and oil industry. The city and surrounding communities are home to many beautiful parks. The Coalinga-Huron Recreation and Park District coordinates with nearby Camp Yeager. The Camp is located near the Pacific Coast and is a popular spot for year-round camping, hiking and wildlife viewing thanks to the pleasant Mediterranean climate. In addition to its natural splendor, Coalinga also hosts a variety of annual events that delight residents and visitors alike. Over Memorial Day weekend, the city holds the Horned Toad Derby. The Derby boasts a carnival, toad races and a wealth of family centered events. The Wham-O-Bass Hot Air Balloon Festival and 4th of July fireworks celebration are also popular annual events. The charming downtown is another great place for quality family time. Filled with local boutiques, restaurants and recreation opportunities, this older part of town is a great place to meet other locals and enjoy the town. 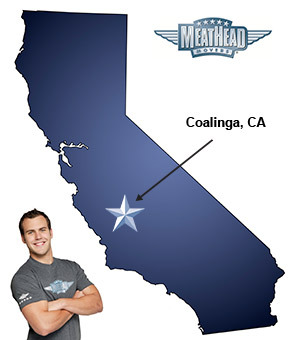 If you’re making a move to Coalinga, Meathead Movers is here to help. We are proud to be your Coalinga movers of choice. Our employees are friendly, clean-cut student athletes from nearby colleges who jog when they’re not carrying your possessions. We offer top-rated local and long-distance moving services. Our customers can take advantage of our Princess Packers service to get their possessions ready for a big move and can ensure a smooth transition to their new homes by working with our moving concierge. We’re trustworthy and reliable, which is why we offer all our clients a 100 % satisfaction guarantee. Moving to Coalinga should never be a hassle. With a 100% satisfaction guarantee, you have nothing to lose. Give our Coalinga movers a call today to learn more about what the Meathead Difference really means. Our staff would be happy to give you a free no-obligation move quote! The 4 guys that came to my house were very friendly, courteous, respectful and hard workers. They were jogging when not carrying something. They asked my input on all questions or concerns before any decision about how to pack, load or unload was made. They continued to work well past the estimated number of hours without any complaints and even provided me a comfortable chair once they had stretch wrapped all my furniture. The young ladies weren't time, very friendly and hard workers. They offered good suggestions for my packing project and were very respectful of me and my belongings. I was told I needed 2 trucks but when they rolled up with a giant truck and a smaller truck my husband and I were sure one large truck would have been sufficient. For some reason the movers (who were AWESOME) started loading the small truck first . When I asked them why they didn't start with the large truck they had no answer.There was only a small amount in the large truck and not packed to the top or anything. Anyway it cost me a ton more money to do 2 trucks and I don't have a bunch of money...Also my estimator,Jake, never returned my phone call after he called and I was in a noisy restaurant unable to talk. I tried to get back in touch after I left the restaurant and someone told me he was on another line and would call back. He didn't call back. MANY of my things that were bubble wrapped and marked FRAGILE were broken. Half of my Mother's Waterford crystal did not survive the move, along with many other things that can never be replaced, to the point I have stopped opening the fragile boxes. You also need a better system for transporting houseplants, as most of them were broken. I wanted someone to come in person to get an accurate estimate because I had no idea how many boxes I would have. But your company wouldn't do it. I would have gladly paid to have an estimator come out! So, it didn't fit on 1st try. On 2nd try, our stuff still didn't fit AND the truck broke down. We were in a rural area with no phone service so I had to drive 15 miles to call supervisor. I was told they couldn't do anything about it 'till he talked to his mover. My husband & I were on our way to a vacation and this 2nd move was unforseen. I was not about to go back. Justin said he can't do anything about it and then put mgr on phone who was very unprofessional! We have to rent a U-haul now to get the rest of our property. A VERY BAD EXPERIENCE. Go to the house beforehand so that a more accurate accounting takes place. I would have paid extra, but was not even given this option! We had to leave our clothes and furniture in the garage of property thst is no longer ours because the truck was full. This has caused us additional stress and money.